Hey there! Thanks for dropping by Silentzephyr's Weblog! Take a look around and grab the RSS feed to stay updated. See you around! “Holi Hai!! !” seem to be one of the most common words heard during this time of the year in India. Every family is outdoors, forgetting their sorrows and their misunderstandings. 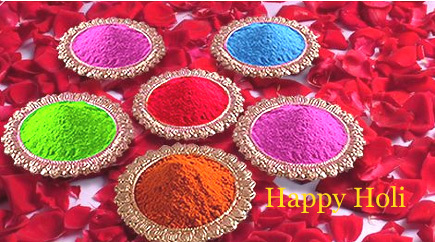 The colours fill the air, paint the clothes and the hearts of those celebrating this wonderful festival. Life is simple, without grudges or heartaches and people stand on the doorstep to fun. Wonderful aroma of yummy Indian home-made sweets and dahi bhallah’s soothe your senses into the mood of festivity. The decorated homes set the mood, and the aalu-puri breakfast is different than it would be on any other day of the year. Kids waking up early with their parents to fill water balloons and adding colour to the water for their “pichkaris” (almost like water guns which shoot the water to a distance) and the sounds of “dhol” (which is an Indian kind of drum) are hard to forget even from 1000s of miles away. People coloured head to toe with beautiful shades, be it natural colours or artificial silvers, dancing to the strong beat of the dhols wherever they may be, is a sight worth seeing. The smiles never fade, and the fun never ends. The wonderful tradition of hugging people and wishing them Happy Holi, no matter what the circumstances may be, is hard to comprehend from outside of the culture. Late afternoon approaches, and people begin returning to their homes after meeting their friends and families and celebrating together. The water and the fun, has exhausted their body but refreshed their minds and added on to life, another beautiful memory. Gorging on the delicious foods, the world seems to fall asleep late afternoon, waking up not too late to visit the people that couldn’t make it in the morning.